Description: Dian-Lee House Bed & Breakfast is a business categorized under bed & breakfast accommodations, which is part of the larger category hotels & motels. Dian-Lee House Bed & Breakfast is located at the address 2109 Jefferson St in Bluefield, West Virginia 24701-4707. The Owner is Sandra Hancock who can be contacted at (304)327-6370. 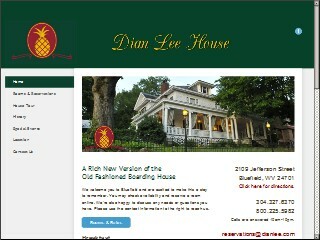 Location & access map for "Dian-Lee House Bed & Breakfast"